NATO’s Trident Junction 18 exercise took place in Norway in late October and early November and was the largest Western exercise since 1980. It was the first exercises, in the winter conditions in the Arctic zone, after the announcement of United States to withdraw from the INF Treaty. It is likely NATO would to open a second front against Russia in the Arctic, in addition to the Baltic region. The purpose of this Arctic ballistic corridor is to facilitate the naval and air offensive against Moscow. For example, once withdrawn from the INF Treaty, the United States could place intermediate-range and medium-range ballistic missiles on the territory of some NATO member states in the Arctic. Taking advantage of a lower number detection systems at the northern border of Russia. From the north of Norway, a NATO member country, the distance to Moscow is 1500 km, and 1000 km to St. Petersburg. The distance between the Svalbard archipelago, administered by Norway, and Moscow is 2000 km. The distance to Russian border from Greenland, which belongs to Denmark, another NATO member country, is 1500 km from and 3000 km between Greenland and Moscow. The distance from Canada’s North, a NATO member country, to the Russian Arctic coast is 2300 km, and 3900 km to Moscow, by North Pole route. Due this reason, Russia was forced to adopt measures to protect the Arctic. The Anti-Ballistic radars Voronezh DM/ M at Dunayevka (Kaliningrad enclave) and Lekhtusi (St. Petersburg) have been updated to compensate the deactivation of Skrunda (Latvia) radar. These Russian radars have a range of 6,000 km. The Volga anti-ballistic radar located at Hantsavitchy (Belarus) has a range of 2000 km and has been upgraded. Another Russian anti-ballistic radar Voronezh VP, operates in Olenegorsk, Kola peninsula ( at border of Finland). Another new-generation Daryal-type radar was placed at Pechora, in the Arctic Circle. Finally, in 2018 a new radar was made operational in the island of Novaya Zemlya. All these early warning and control radars operate in an alert network (code 590), controlled by the 29b6 Container system, located in Nizhny Novgorod (250 km north-east of Moscow).Although the detection range of the 29b6 Container is only 3000 km, it has multiple dedicated storage memory facilities and servers, using the latest generation microprocessors and satellite communication equipment. All Russian antiballistic radars are OTHR type( Over the Horizon Radar). For very long distance detection, they use the ionospheric reflection of electromagnetic waves. Russian Air Force has begun the restoration and modernization of seven airfields near the Arctic Circle, abandoned after 1990. Fighter squadrons equipped primarily with MiG-31 aircraft have been redeployed. The 80th and 200th independent motorized brigades, belonging to the 14th Russian Arctic Army Corps are resposnable of the defense of the regions Murmansk, Arkhangelsk and Nenets. In cooperation with the Russian Northern Fleet and the VI-th Air force& Air defence army, of course. They received T-80 MBT, BTR-82A APC, 2S19 Msta self-propelled howitzers, and Trekol 39294 an amphibious vehicle. Trekol was equipped with special large tubeless tires that allow to move on sand, ice, snow and swamps. Troop transport vehicles IFV was replaced with DT-30 Vityaz, arctic multi-purpose articulated tracked carrier with a speed of 60 km/h. DT- 30 vehicles was adapted like platforms for mobile Arctic- antiaircraft systems such as Tor-M2DT, Pantsir-S1, and anti-tank systems such as 9K114 Shturm. The reconnaissance and Special Operations units of both brigades operate on type TTM 1901 and As-1 snowmobiles, equipped with air conditioners and GPS in the cockpit, Snowmobiles may be carried in the cargo bay of a Mi-8/17 helicopter. The Northern Sea Route is a shipping lane running along the Russian Arctic coast, allowing passage from the Atlantic to the Pacific via the Northern coast of Siberia. Starting in 2019, foreign warships will only be able to sail along the Northern Sea Route after notifying Russian authorities, Mikhail Mizintsev, head of the National Center for Defense Management of Russia, said. 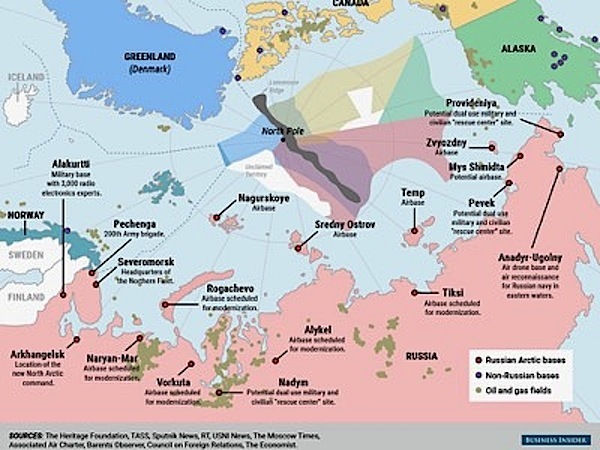 "To eliminate the legal vacuum in terms of the use of the Northern Sea Route, interdepartmental work has been organized to improve Russian legislation, which will result in the notification of the nature of navigation of foreign warships. The work will be completed by the beginning of the navigation (when the waterway becomes passable) in 2019," said Mizintsev. In June 2015, Russia announced development plans for the Northern Sea Route for the period 2015-2030.
and other related articles on this site. ‘War With Russia?’, like the biography of a living person, is a book without an end. The title is a warning - akin to what the late Gore Vidal termed “a journalistic alert-system” - not a prediction. Hence the question mark. I cannot foresee the future. The book’s overarching theme is informed by past and current facts, not by any political agenda, ideological commitment, or magical prescience. To restate that theme: The new US-Russian Cold War is more dangerous than was its 40-year predecessor that the world survived. The chances are even greater that this one could result, inadvertently or intentionally, in actual war between the two nuclear superpowers. Herein lies another ominous indication. During the preceding Cold War, the possibility of nuclear catastrophe was in the forefront of American mainstream political and media discussion, and of policy-making. During the new one, it rarely seems to be even a concern. Clinton may have been prompted by another outburst of malpractice by The New York Times and The Washington Post. On September 20 and 23, respectively, those exceptionally influential papers devoted thousands of words, illustrated with sinister prosecutorial graphics, to special retellings of the Russiagate narrative they had assiduously promoted for nearly two years, along with the narrative’s serial fallacies, selective and questionable history, and factual errors. Astonishingly, neither paper gave any credence to an emphatic statement by the Post’s own Bob Woodward—normally considered the most authoritative chronicler of Washington’s political secrets—that, after two years of research, he had found no evidence of collusion between Trump and Russia. Nor were the Times, the Post, and other print media alone in these practices, which continued to slur dissenting opinions. CNN’s leading purveyor of Russiagate allegations tweeted that an American third-party presidential candidate had been “repeating Russian talking points on its interference in the 2016 election and on US foreign policy.” Another prominent CNN figure was, so to speak, more geopolitical, warning, “Only a fool takes Vladimir Putin at his word in Syria,” thereby ruling out US-Russian cooperation in that war-torn country. Much the same continued almost nightly on MSNBC. For most mainstream-media outlets, Russiagate had become, it seemed, a kind of cult journalism that no counterevidence or analysis could dent and thus itself increasingly a major contributing factor to the new Cold War. Still more, what began two years earlier as complaints about Russian “meddling” in the US presidential election became by October 2018, for The New Yorker and other publications, an accusation that the Kremlin had actually put Donald Trump in the White House. For this seditious charge, there was also no convincing evidence—nor any precedent in American history. These may have been outlandish statements by untutored political appointees, but they again inescapably raised the question: Who was making Russia policy in Washington - President Trump, with his avowed policy of “cooperation,” or someone else? But how to explain, other than as unbridled extremism, the comments by Michael McFaul, a former US ambassador to Moscow, himself a longtime professor of Russian politics and favored mainstream commentator? According to McFaul, Russia had become a “rogue state,” its policies “criminal actions” and the “world’s greatest threat.” It had to be countered by “preemptive sanctions that would go into effect automatically”—“every day,” if deemed necessary. Considering the possibility of “crushing” sanctions proposed recently by a bipartisan group of US senators, this would be nothing less than a declaration of permanent war against Russia: economic war, but war nonetheless. - Meanwhile, other new Cold War fronts were becoming more fraught with hot war, none more so than Syria. On September 17, Syrian missiles accidentally shot down an allied Russian surveillance aircraft, killing all 15 crew members. The cause was combat subterfuge by Israeli warplanes in the area. The reaction in Moscow was indicative- and potentially ominous. At first, Putin, who had developed good relations with Israel’s political leadership, said the incident was an accident caused by the fog of war. His own Defense Ministry, however, loudly protested that Israel was responsible. Putin quickly retreated to a more hard-line position, and in the end vowed to send to Syria Russia’s highly effective S-300 surface-to-air defense system, a prize long sought by both Syria and Iran. Clearly, Putin was not the ever-“aggressive Kremlin autocrat” unrelentingly portrayed by US mainstream media. A moderate in the Russian context, he again made a major decision by balancing conflicting groups and interests. In this instance, he accommodated long-standing hard-liners in his own security establishment. The result is yet another Cold War trip wire. With the S-300s installed in Syria, Putin could in effect impose a “no-fly zone” over large areas of the country, which has been ravaged by war due, in no small part, to the presence of several foreign powers. (Russia and Iran are there legally; the United States and Israel are not.) If so, this means a new “red line” that Washington and its ally Israel will have to decide whether or not to cross. Considering the mania in Washington and in the mainstream media, it is hard to be confident that restraint will prevail. In keeping with his Russia policy, President Trump may reasonably be inclined to join Moscow’s peace process, though it is unlikely the mostly Democrat-inspired Russiagate party would permit him to do so. This reminds us that the new Cold War, from NATO’s eastward expansion and the 2014 Ukrainian crisis to Russiagate, has been an elite project. Why US elites, after the end of the Soviet Union in 1991, ultimately chose Cold War rather than partnership with Russia is a question beyond my purpose here. As for the special role of US intelligence elites - what I have termed “Intelgate” - efforts are still underway to disclose it fully, and are still being thwarted. A full explanation of the post-Soviet Cold War choice would include the US political-media establishment’s needs - ideological, foreign-policy, and budgetary, among others - for an “enemy.” Or, with the Cold War having prevailed for more than half of US-Russian relations during the century since 1917, maybe it was habitual. Substantial “meddling” in the 2016 US election by Ukraine and Israel, to illustrate the point, did not become a political scandal. In any event, once this approach to post-Soviet Russia began, promoting it was not hard. The legendary humorist Will Rogers quipped in the 1930s, “Russia is a country that no matter what you say about it, it’s true.” Back then, before the 40-year Cold War and nuclear weapons, the quip was funny, but no longer. Whatever the full explanation, many of the consequences I have analyzed in War With Russia? continue to unfold, not a few unintended and unfavorable to America’s real national interests. Russia’s turn away from the West, its “pivot to China,” is now widely acknowledged and embraced by leading Moscow policy thinkers. Even European allies occasionally stand with Moscow against Washington. The US-backed Kiev government still covers up who was really behind the 2014 Maidan “snipers’ massacre” that brought it to power. Mindless US sanctions have helped Putin to repatriate oligarchic assets abroad, at least $90 billion already in 2018. The mainstream media persist in distorting Putin’s foreign policies into something “that even the Soviet Union never dared to try.” And when an anonymous White House insider exposed in the Times the “amorality” of President Trump, the only actual policy he or she singled out was on Russia. We also know that such leaders, though embedded in and insulated by their elites, hear and read other, nonconformist voices, other thinking. The once-venerated American journalist Walter Lippmann observed, “Where all think alike, no one thinks very much.” This book is my modest attempt to inspire more thinking. This article was originally published by The Nation and is adapted from the concluding section of Stephen F. Cohen’s War With Russia? From Putin and Ukraine to Trump and Russiagate, just published, in paperback and e-book, by Skyhorse Publishing. MOSCOW (Sputnik) - UK Defence Secretary Gavin Williamson announced on Sunday the increase in the country's military presence in the Arctic to counter Russia's activities in the region. "Whether it’s sharpening our skills in sub-zero conditions, learning from longstanding allies like Norway or monitoring submarine threats with our Poseidon aircraft, we will stay vigilant to new challenges", Williamson said, cited by The Telegraph newspaper, adding that the new P8 Poseidon maritime patrol aircraft would be used to constraint activities of Russian submarines in the region. Williamson made his statement during a visit to a new base of Royal Marines in the area of Bardufoss in northern Norway. The Royal Marines will also be deploying over 1,000 troops to Norway annually over the 10-year period for training within an agreement between the two states, he added. Nine P8 Poseidon planes will be deployed to the Royal Air Force Lossiemouth airbase in Scotland in 2020 to conduct reconnaissance in the North Atlantic and in the Arctic. As Russia bolsters its efforts to secure and tap the Arctic, both the UK and the US have been vowing to meet its “challenge” – a premise that could lead to war, experts say, if their naval powers could muster the capabilities. “It’s nobody’s lake,” said US Admiral James Foggo in a recent interview with US media – the latest in a string of American warnings against Russia’s northward push. His concern is primarily for “Arctic Council nations – of which we are a member,” and which are not interested in the Northern Sea Route being exploited by adversary powers like Russia and China. But Russia is better positioned both legally and physically to oversee the Arctic and, while still dangerous, the bellicose statements carry little weight for the reality on the ice, experts have told RT. Ultimately, he could be aiming just for political gain. With the UK in political turmoil it often appears that Williamson is even positioning himself as a future candidate to replace Theresa May as PM. Likewise in the US: James Foggo's “nobody's lake” comment was tellingly lacking in detail as to how exactly the US is going to keep Russia out of the Arctic, says retired colonel Mikhail Khodarenok. War can be averted, the experts believe, though the danger of escalation is very real. The situation, according to Khodarenok, is complicated by the vagueness of international law regarding the Arctic. “James Foggo’s statement is a fresh indication that the Arctic is becoming an arena of global rivalry over transport lanes and natural resources,” Khodarenok said. World history knows no precedent of such a rivalry playing out without considering military factors. Shoebridge, on the other hand, believes that when faced with the danger of an armed incident spiraling into “uncontrolled escalation,” cooler heads will prevail. “Despite the confrontational language they might use, most leaders of most states want to avoid this,” he said. Judge Sharon L. Gleason, who is based in Alaska, said President Trump had exceeded his authority. The decision is expected to be appealed, but it has broader implications for other drilling efforts by Mr. Trump.